YouTube is the place that we all go to when we want to watch some of the world’s best video content and it’s a pretty well known fact that the majority of content is watched on a smartphone. To that end, the folks over at YouTube have started to evaluate smartphones, calling some of them a “YouTube Signature Device” depending on how well they tick a number of boxes that make them particularly great for consuming YouTube content. 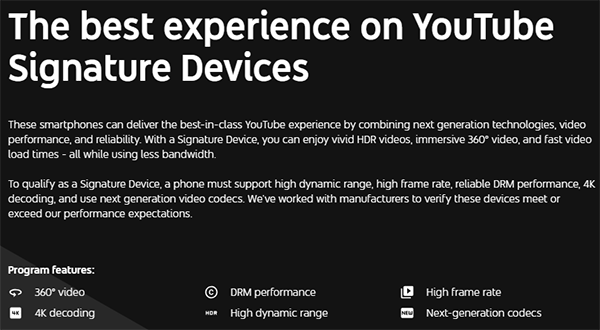 The YouTube Device Report highlights the best devices, or signature devices, that are most suited to be being used for watching YouTube. Those phones support key features such as high dynamic range, 4K, 4K at 60fps, and 360-degree video. The report also looks for devices that support next-generation codecs while also sporting good DRM performance. YouTube says that it is also working with smartphone makers in an attempt to try and make phones better suited to streaming YouTube video, which will be good news for Apple seeing as its iPhone apparently does not make the grade due to 4K codec war between Apple and Google. Those that do, all 18 of them, are Android phones. 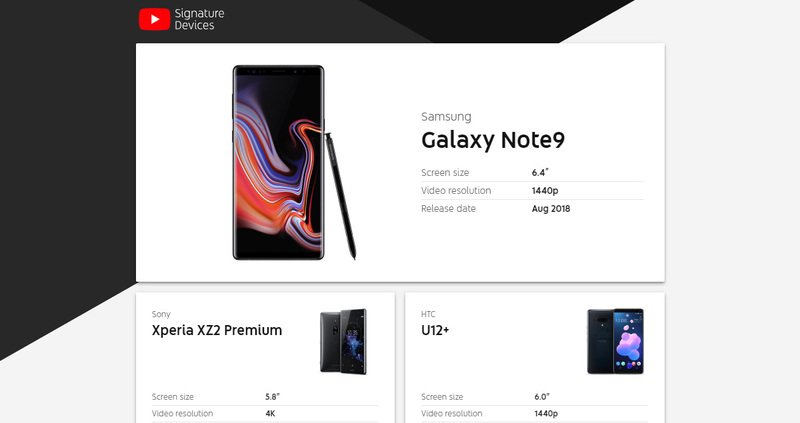 Those include the newly announced Samsung Galaxy Note 9 as well as the Pixel 2 XL and OnePlus 6. There are plenty other less popular options, too, but the lack of any iPhone making the list is an interesting little side note here. It’s unlikely that anyone will be using this new “standard” as a way of deciding which smartphone to buy, but it’s sure to rankle those in Cupertino that their devices aren’t mentioned. It will be interesting to see if this is factored into future iPhone software and hardware designs moving forward. Yikes there are 18 phones better than Any iPhone for Youtube? Or perhaps no one donated an iPhone to test? YouTube is biased against Apple. Wanna know why? Because YouTube is owned by Google. Which is the maker of Android, which is why only Samsung/Google devices made the top of this list. YouTube is not gonna say that an Apple prouduct is better than ANY of theirs at displaying videos. Even tho it is. The Note 9 doesn’t even deserve to be on the list as it’s not available to the public. It’s just advertisement, that’s all this list is for.